What’s in the Crockpot? Part 14 | Keep It Up, David! You know how popular, older TV shows are getting rebooted left and right nowadays? Will & Grace, Roseanne, Queer Eye… and there’s more to come. So I thought I’d reboot one of the classic features on my blog. 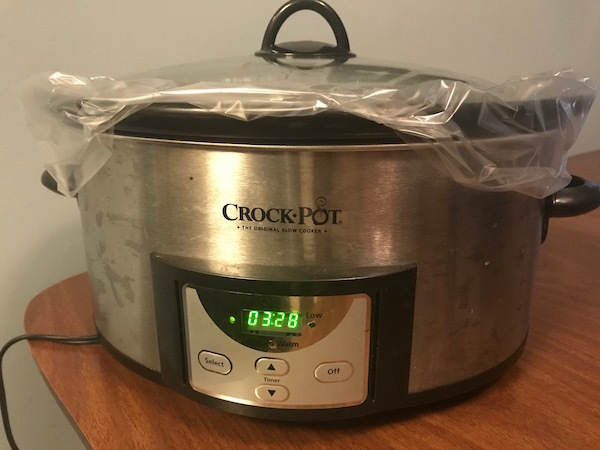 A silly – I mean wonderful – little game called “What’s in the Crockpot?” that I used to play frequently with my readers. The rules are simple. Just guess what’s in the crockpot! Are you ready? 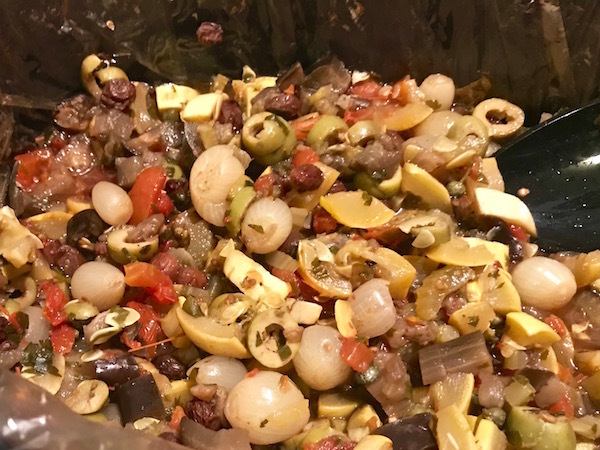 Crockpot Caponata is in the crockpot! 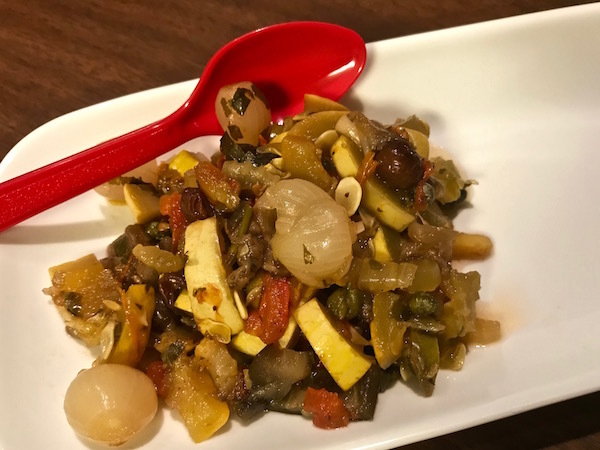 Caponata is a warm, eggplant-based vegetable salad from Sicily. It can actually be served warm or cold, and in this case, I served it warm, at a little get-together. 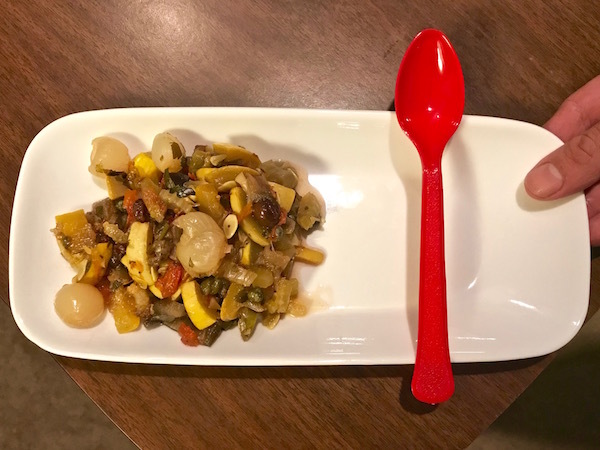 My recipe was inspired by a Better Homes & Gardens recipe, but I made some changes, mostly based on what I had in my house and to take out the added sugar. 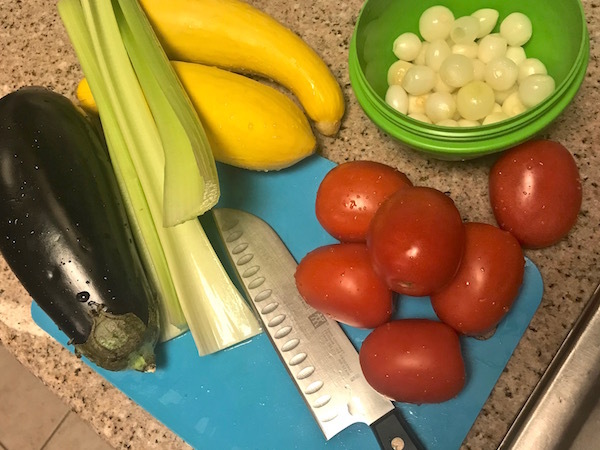 The onions went into the fridge, and I pulled them out the next day, and tossed them in the crockpot, alongside a bunch of vegetables that I had to chop. 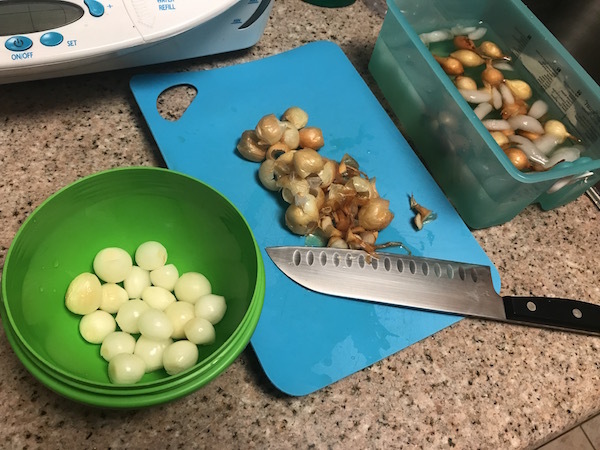 One 12-ounce package fresh pearl onions, peeled. 1/2 bunch parsley (flat leaf), minced. I reserved a few tablespoons for the very end, for a pop of bright green color just before serving. Once everything is in the crock, just let it cook! 3 hours on high, or 6 hours on low. the aforementioned reserved minced parsley. One more quick stir, to incorporate the new ingredients, and voila! You’re done! My friend Jonathan’s finger. He was determined to make an appearance in this blog post! Lots of flavor in this simple dish! 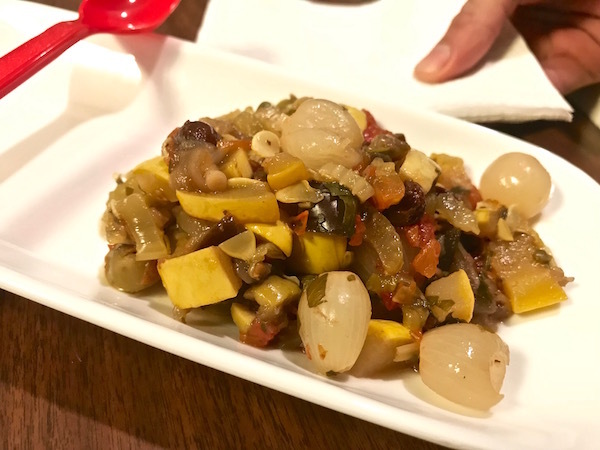 The veggies have different textures, with bits of sweetness and brininess, from the raisins and capers, respectively. And you can switch this up pretty easily. Used canned tomatoes and make it more stew-like. Swap out yellow squash for zucchini, or the pearl onions for shallots. Instead of raisins, try chopped dates or prunes. Endless variations! This was a big hit at the get-together, and a couple people asked for the recipe. (I’ll send them the link to this blog.) Even so, there was lots of leftovers (this recipe makes a lot), and it made for delicious, guilt-free eating the next day. And it’s as tasty cold as it is warm! Are you hooked on “What’s in the Crockpot?” Play more, by clicking here, here, here or here. Plus, check out all my healthy recipes here. This entry was posted on Monday, March 26th, 2018 at 1:08 am and is filed under Uncategorized. You can follow any responses to this entry through the RSS 2.0 feed. You can leave a response, or trackback from your own site. Seems like for a vegetarian dish, you are cooking all the nutrients out of the vegetables in a crock pot. I’d say, just use a covered skillet on the stove top for about 15-20 minutes? Cooked is cooked. You’re also cooking out nutrients on the stovetop, no? Who’s to say that cooking on higher heat for a shorter period is better or worse than cooking at a super-low temperature for longer? Some nutrients may be lost either way, but cooking food also helps break down the cell structure in plant material, making it easier for us to digest nutrients – something our gut can’t do on its own.